Weigela Kosteriana Variegata is a dense, compact and round deciduous shrub that blooms masses of tubular flowers in late spring and summer. These are easy to grow bushy shrubs that will flourish even with low upkeep and care. 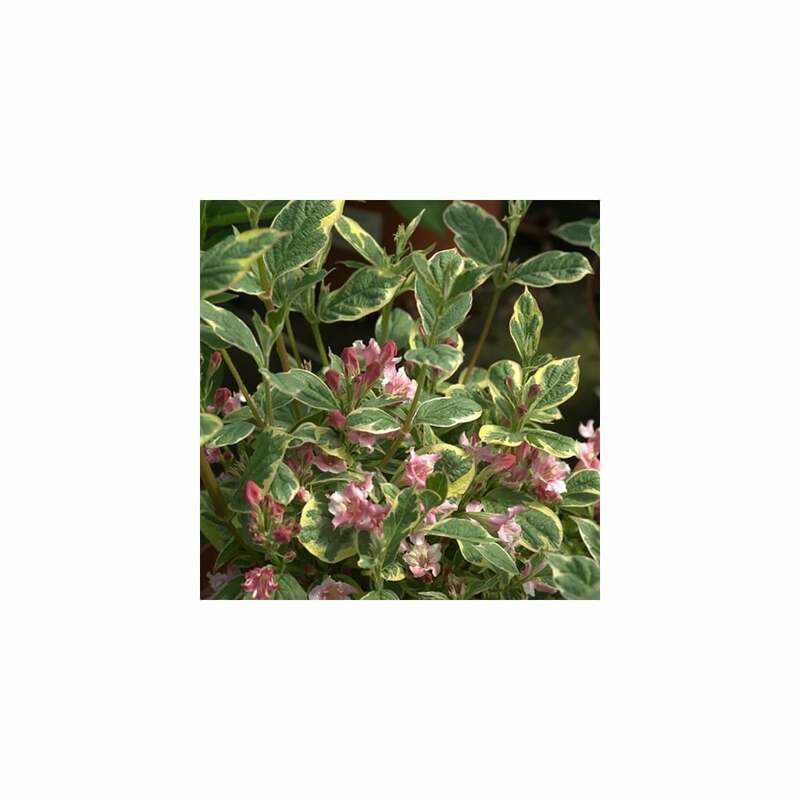 Apart from their dazzling flowers, their bright variegated foliage holds an ornamental value of the plant. If you want to decorate dull corners and borders in your garden, this is the perfect plant! Kosteriana Variegata is best for hedging and screening purposes. It blooms trumpet-shaped pale pink flowers that grow in clusters. These flowers are backlit with beautiful ovate green leaves that are margined with bright yellow. This gorgeous combination of flowers and foliage makes Kosteriana an excellent border flowering plant. These bushes will grow as tall as 2 metres, demanding low maintenance and care. Plant them in full sun or partial shade in a moist soil that is well-drained. Their blooming performance is enhanced when they are planted in sunny spots. Adding a layer of mulch will retain moisture in the soil, keeping the roots cool. These medium-sized bushes are most suitable for flowering border shrubs. Water the young plants moderately until they establish. Prune old wood back hard right after the flowering period to encourage new growth before next flowering season. Weigela shrubs are very popular among hummingbirds. They will cherish and brighten up your garden all spring and summer long. Use Kosteriana Variegata at the back of a border where there is enough space for its branches to spread out. Use them in groupings as hedges or as a single garden specimen.